There will be a temporary increase in the number of personnel under the Regional Assistance Mission to Solomon Islands (RAMSI) Participating Police Force (PPF) as the Mission assists the Royal Solomon Islands Police Force (RSIPF) to conduct major security operations around the 2014 Solomon Islands National General Election. This is the largest operation the RSIPF will be leading since RAMSI arrived in 2003. About 90 additional police officers from Australia, New Zealand and several Pacific Island countries including the Cook Islands, Vanuatu, Papua New Guinea, Tonga and Tuvalu will join the RAMSI PPF. They will be working side by side with the RSIPF in election security planning and conducting high visibility operations. They will also be engaging with communities, providing mobility and logistical assistance, and tactical support if required. 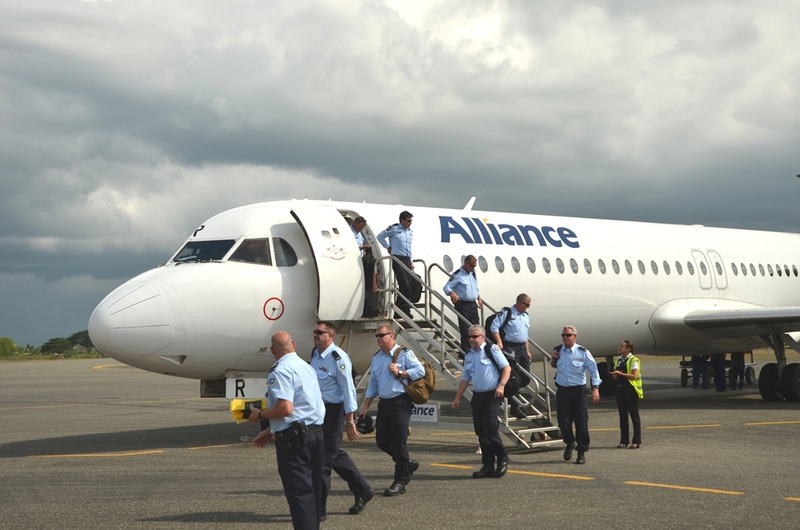 The additional RAMSI PPF personnel from Australia arrived yesterday (Monday 10th November) in Honiara and personnel from New Zealand arrived today (Tuesday 11th November 2014). Australian High Commissioner Andrew Byrne said that the deployment of additional Australian police officers to bolster RAMSI’s PPF was part of Australia’s ongoing commitment to stability in Solomon Islands. “New Zealand is pleased to provide additional police personnel to support the RSIPF during the election period, continuing the assistance New Zealand has provided since the PPF was established,” said Ms Marion Crawshaw, New Zealand High Commissioner to Solomon Islands. RAMSI PPF Commander Greg Harrigan said: “The PPF are looking forward to working closely with the RSIPF who will lead the security operation. The additional officers from Australia, New Zealand and the Pacific island countries will leave after the formation of a new Solomon Islands Government. You can view more photos in our gallery here.